It can effectively reduce the noise outside compared to the traditional ones. 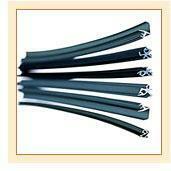 There rubber profiles are beautiful and endurable and are ideal product for replacing the traditional profiles. Some profiles are push-and-pull type. It is convenient to store and easy to install. This product is good looking. High precision & low tolerance. Extruded rubber profiles can be cut and coil or spooled according to specified lengths. There are high-speed cut-to-length and coiling machinery to do this. Pressure sensitive adhesive (PSA) can be applied to extruded rubber profiles. Extruded rubber profiles can be to used to produce custom rubber gaskets and o-rings according to specifications. Profiles are used serve as sealing components with anti friction qualities for the smooth operation of windows and doors. These rubber profiles are extensively used in a vast range of diverse applications including automotive air-conditioning. There are rubber profiles that serve as sealing components used between the glass and aluminium sections that from the core of the modern building indust ry.